NEW YORK (CNNMoney) -- Apple's new iPad will be a turning point for the wireless industry: It's the beginning of the end for 3G. The updated iPad Apple unveiled Wednesday will be the first Apple device to support a 4G wireless technology called Long Term Evolution, or LTE. So far, 4G device sales have badly lagged behind 3G-capable smartphones and tablets. A marquee device like the iPad could fuel a sales surge. "Apple is the last holdout when it comes to 4G," said Ari Zoldan, CEO of Quantum Networks, a next-generation network supplier. "To add them to the list seals the deal and ensures the technology's dominance in the marketplace." Verizon (VZ, Fortune 500) and AT&T (T, Fortune 500) have spent billions upgrading and rolling out their new LTE networks. Verizon got a head start, turning on its network in late 2010, and it now covers more than 200 million people. AT&T's LTE network went live in September 2011, and it currently covers 74 million Americans. Sprint (S, Fortune 500) and T-Mobile have announced plans for LTE but have not yet turned those networks on. Despite its widespread 4G coverage, Verizon has sold just 5.4 million LTE devices -- total. By comparison, it sold 4.2 million iPhones last quarter. AT&T has not yet broken out its 4G device sales. The high-profile iPad could be the spark that the wireless carriers need to ignite 4G network adoption. "This -- overnight -- means millions of people will be on the 4G network that weren't there before," Zoldan said. "No other single device will allow for such a shift." IPad sales topped 15 million last quarter, and industry analysts expect Apple to sell more than 50 million this year -- roughly 40 million of which will be bought after the new iPad goes on sale. The most popular iPad model is Wi-Fi-only, but if the current sales trends continue, about a third of the iPads Apple sells will be 4G-enabled. That works out to around 13 million 4G iPads this year. 0:00 / 2:04 iPad 3? 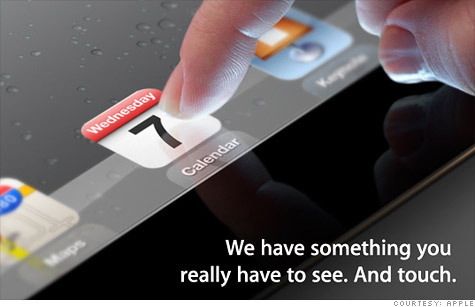 iPad 2S? Who cares? That's a big number, but it's not the seismic change the carriers are hoping for. That, analysts say, will come when Apple (AAPL, Fortune 500) unveils a 4G-enabled iPhone. "The iPhone will have much larger impact than the iPad because of sheer numbers," said Ken Rehbehn, analyst at Yankee Group. "An iPhone with LTE will represent an inflection point for 4G." Carriers can't wait. They're eager to shift people away from clogged 2G and 3G networks and onto much more efficient 4G bands. They've had very limited success so far, but where Apple goes, consumers tend to follow. LTE offers download speeds of between five and 12 megabits per second -- about the same or faster than the typical home broadband connection. In many ways, 4G technology is capable of supplanting Wi-Fi, though the industry's spectrum limits and usage caps still make Wi-Fi necessary for data-intensive operations like streaming video. There's one more caveat: Though both AT&T and Verizon have rolled out LTE technology, the networks utilize different frequencies that are not compatible with each other. As it did with the 3G iPad, Apple will sell two versions -- one for Verizon and one for AT&T -- that cannot be switched to a different network.